Cooling Tower Servicing – Addresses Legionella risk and performance issues through removal, inspection and pressure cleaning of all critical components inside a cooling tower. Coolclean understands the importance of correct cooling tower maintenance. We are often called on to correct Legionella safety issues that arise due to sub-standard maintenance procedures. Why is it important to maintain cooling towers correctly? Routine cooling tower clean: Victorian Public Health and Wellbeing Act 2008, cooling tower disinfect, clean and re-disinfect, procedure. AS/NZS 3666.1:2011 Section 4. Air-handling and water systems of buildings. 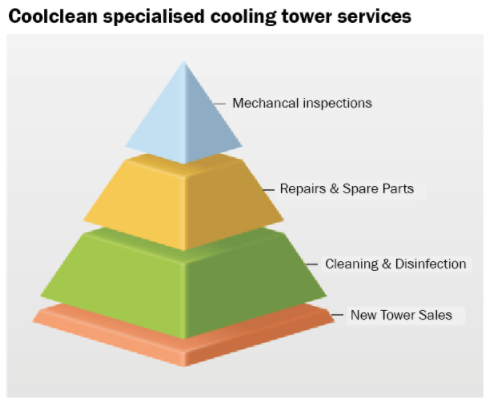 Coolclean specialises in maintaining cooling tower equipment for optimal performance and safety. (We are not a water treatment company – where the focus is water quality). Since Coolclean’s inception nearly 30 years ago, our focus has been on work quality. We pride ourselves on our capacity to act quickly, while maintaining the highest possible standards at competitive prices. Our team of service technicians are fully trained to meet all cooling tower cleaning and maintenance requirements – from repairs, cleaning and disinfection services, to upgrades and replacements. Regular cleaning of cooling towers, combined with the thorough inspection of mechanical components is critical in reducing Legionella risk. For example, correctly maintained drift eliminators reduce ‘drift’ and prevent Legionella bacteria escaping the tower. This is a major benefit and safeguard against Legionella. Coolclean’s standard Routine Clean includes the inspection of all mechanical components including drift eliminators, fill pack and water distribution system. See Coolclean blog items: ‘Legionella and the role of drift eliminators‘ and April 2017 Media Release ‘Legionella outbreak in Melbourne – How to help prevent future outbreaks’. Coolclean is well placed to deliver quality services to our customers. Cooling tower maintenance is imperative to reduce Legionella risk. We encourage our clients to ensure they are informed as to why cooling tower cleaning and disinfection services are vital in order to prevent the formation of Legionella bacteria, which can cause outbreaks of Legionnaires’ disease, a form of pneumonia that has potential to be fatal. In recent years, Legionella outbreaks have been linked to cooling towers. This is because Legionella thrives in places where untreated or under-treated water is warm and there is potential for water droplets to escape in the form of condensation or drift. Cooling towers have the potential to act as a breeding ground for Legionella if water treatment, cleaning and component maintenance is not performed correctly. If not conducted on a regular basis, algae or scale may begin to grow – be aware that these are warning signs of possible Legionella. The Public Health and Wellbeing Act 2008 and The Health and Wellbeing Regulations 2009, detail the requirements for the registration and maintenance of cooling tower systems. The registration of a cooling tower system is conducted by the Department of Health and Human Services. The Department of Health and Human Services can enforce its powers of prosecution under the Public Health and Wellbeing Act 2008. This concerns all offences relating to Legionella controls, including the failure to register a cooling tower system, prepare a Risk Management Plan (RMP), or have it reviewed or audited. It should be noted that the legislation applies to cooling tower systems used for industrial processes, as well as those used for refrigeration and farming purposes. The officers from the Department of Health and Human Services are authorised to enforce the Act and Regulations. They also have powers of entry to investigate potential contraventions. Coolclean offers peace of mind in terms of correct maintenance of cooling tower equipment. Our experienced technicians provide a complete range of cooling tower repairs and have spare parts on-hand. We service all types of commercial and industrial cooling systems. Keep in mind that by performing regular cooling tower inspection and maintenance, you will reduce the likelihood of unplanned downtime due to equipment failure, while ensuring that all systems are operating at peak efficiency. Coolclean provides scheduled maintenance, while also being responsive to breakdowns, where our technicians arriving on-site promptly with a fully stocked vehicle (see Cooling Tower Repairs). We also hold in stock a range of cooling tower spare parts, at the ready when you require them, including drift eliminators, air intake louvres an fill pack (see Cooling Tower Spare Parts). 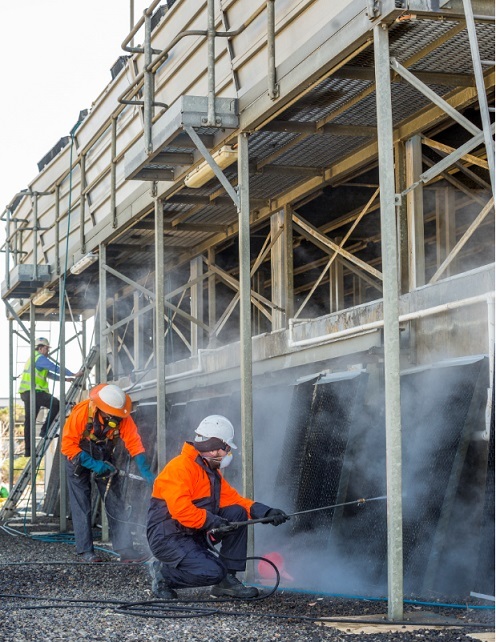 Under Victorian government regulations, the cleaning of cooling towers must be completed at least twice per year as a minimum requirement, however best practice is for cooling towers to be professionally cleaned every three months. Regular cleaning and disinfection of cooling towers not only helps to protect public health, but significantly reduces operating and maintenance costs. We can’t reiterate the importance of cleaning and sanitisation of cooling towers in order to control harmful bacteria (Legionella is only one example). During a standard clean, Coolclean technicians perform a thorough inspection of all components including drift eliminators, water nozzles, strainers and the ball float. As detailed below, we then provide a report outlining the current condition of the system, together with photos and a quote to repair any issues that identified. See Cooling Tower Cleaning and Disinfection for more details. Over the years, we have found that some organisations are not aware of who conducts inspections of their cooling tower components. In worst case scenarios, component inspection is simply not being conducted, with clients failing to assess the potential impact in the event a cooling tower failing. With the system shut down, profits can be significantly impacted. Inspection: Our experienced team inspects your cooling towers. If there are no problems that need to be addressed, our work is done. Protection – Our technicians hold a record of all necessary details in relation to your cooling towers. This is vital if there is a problem down the track, as it allows us to respond quickly to conduct repairs. A cooling tower component inspection is a proactive approach, before an issue arises. See Mechanical and Component Inspections for more details. The primary design standard for cooling towers and cooling water systems is AS/NZS 3666.1. Its primary focus is the control of microbes such as Legionella in building water and air handling systems, particularly cooling water systems and cooling towers. AS/NZS 3666.2 is a sister standard and is concerned with the operation and maintenance of air-handling and water systems. Again microbial control within such systems is the main focus. Both AS/NZS 3666 part 1 and part 2 are called up in the Building Code of Australia as primary referenced standards and both are mandatory in all states and territories of Australia. Apart from building legislation there is individual state specific legislation and regulations relating to cooling towers which should be complied with as they are relevant to both installation and maintenance. AS/NZS 3666.3 is the third standard of the series and deals with a performance based approach to the maintenance of a cooling water system with respect to the control of microorganisms. The approach outlined in this standard combines an automatically monitored water treatment system with prescribed monitoring, assessment and control strategies to maintain a low risk environment within the cooling water system. The AS/NZS 3666 standards reference a series of associated documents and standards which also form requirements of the standards. AS 5059 is a risk management standard specific to the design and operation of cooling towers associated with power stations. There are no cooling tower product standards developed for the Australian/New Zealand application; however there are standards for components and materials used in the manufacture of towers. Drift eliminators are assessed by the laboratory test method AS 4180.1. Industry certification standards and schemes do exist for cooling tower products and performance, however their adoption in Australia and New Zealand has been limited to date.